One year at the beginning of the Golden Week vacation in late April,I was trying to dry my bike off from getting caught in a typhoon that had just roared through Kansai, and I wondered if it would roar through the rest of Japan with equal speed. I decided to take a chance that it would... so I packed, got up at the crack of dawn and boarded a bullet train bound for Shizuoka. I was in luck: the typhoon had blown through and the skies were clearing me a path to three days of near-perfect weather of cycling along the Pacific coast toward Ise. 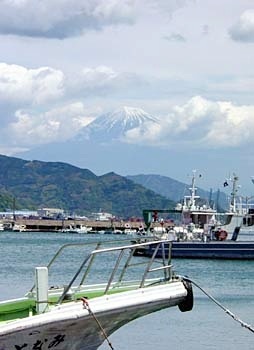 This is the harbor just south of my starting point: Shimizu, one stop east of Shizuoka,. You can see Mount Fuji peeking through the soon-to-be-dispelled clouds. I'd come here to check out a series of bikepaths that promised to take me most of the way to my destination. The first one I stumbled on was a freebie: not officially part of the route, just a local railroad that had gone bust and been converted into a bikepath. 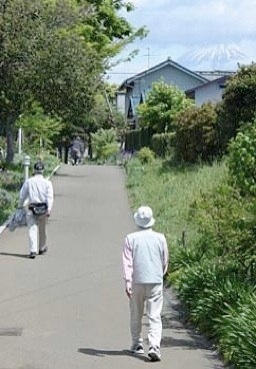 It was short but sweet, with lots of local residents getting their morning exercise... and yet again with Mt. Fuji peeking out above the pastoral scenery.